Back when I was a stupid girl (December), I purchased Smashbox Brow Tech Wax to tame my unruly brows. Even though I had been taming my brows for years with a little spritz of hairspray, I spent, against my better judgement, $20 on this fantastic product, thinking it would do things no one else had promised. Well, it was good and all, while it lasted. A little pot of wax does not go very far on bushy Italian brows. And no, I'm not going to tweeze them; I like them gloriously bushy, ala Brooke Shields, circa 1980. But then one day I had this Aha! 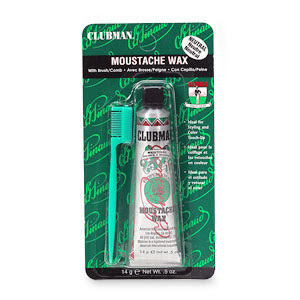 moment and thought, Why don't I just use mustache wax?? I mean, those guys with handlebar mustaches that never seem to move must be in on some underground secret for sure. So I went on the hunt. The first few places I tried didn't have what I needed. I guess since it's not 1950 anymore, there aren't many men out there who use the products my grandfather, a barber, used to groom hair. No sticky pomades, no greased back "do" and no mustache wax. This product has a delightfully citrus scent and tames with unheard of precision in the bushy brow world. I am thrilled by my brilliance. And all of this for $4.39 courtesy of CVS drugstore. It's okay; you can envy me now. It Should Be Called "Thimble Shot"
Is It REALLY Such A Mystery? ?